Rather than continue to write what is proving not to be the most inspired professional paper of my career, I thought I’d take a break and write something for ye olde bloggue. And while I could write about who is running and who is not, reporting on breaking news is not really my forte. If you haven’t noticed by now, this blog is always at least a couple of days out of date. That’s partially by design. Anyway, enough blathering. Onto redistricting in Taipei City! Remember the rules. Populations can’t deviate from the mean by more than 15%. You can’t cut up administrative districts unless they exceed 115% of the average electoral district. Everything has to be contiguous. And you have to take into account geography, transportation networks, historical legacies and such. In other words, you can’t stick strange areas together. That second rule, about cutting up administrative districts, is useless in Taipei. Taipei has 12 administrative districts, and 8 electoral districts. None of the administrative districts is big enough to cut by that rule, but you can’t draw eight equally sized districts without cutting something. So basically you are free to do as you please on that count. This gives you a lot of freedom to maneuver. When I discussed Taipei County, the size of townships eliminated most of the designers’ freedom to produce different sorts of plans. In Taipei City, you could go in lots of different directions. First, look at how reasonable the lines appear at first glance. These are not weird shapes. They basically follow administrative lines or cut districts into recognizable pieces. If you are inclined to scream unfair, remember that before we start digging into the politics, this plan doesn’t hit you in the face with obvious political manipulation. Second, a little about basic partisan geography. The KMT is dominant in the southern part of the city. It doesn’t matter how you arrange Wenshan, Da-an, Zhongzheng, and Xinyi; the KMT will have an easy majority no matter what you do. The KMT also has a big majority in Neihu. The DPP is stronger along the river (the western border) and toward the north. The DPP only has a clear majority in Datong and in the Shezi part of Shilin. However, there are lots of areas that can go either way. Most of Wanhua, Zhongshan, the rest of Shilin, Beitou, and smaller parts of other areas are basically tossup areas or only lean slightly to the KMT. So the real question is how to draw the lines in northwest half of the city. D6, D7, and D8 are all KMT strongholds and undersized, and they seem to have gotten even smaller over the past four years (or maybe there is something systematically different between population in 2006 and eligible voters in 2010). But this isn’t too bad, and the biggest district (D4) is also a fairly safe KMT district. So maybe I’m making too much of this except in one case, which I will discuss below. You can see why all the DPP politicians want to represent D2. It’s the only one that Su won, and he won it handily. D1 and D5 are within shouting distance, but they still lean clearly to the KMT (and remember that this was a good year for the DPP). They have to be considered unlikely, though possible, for DPP candidates. The other five districts are probably impossible. In the parlance of redistricting, this is a classic packing plan. The KMT took the DPP’s very best areas and put them into one district, effectively sacrificing that district (their victory in D2 in 2008 notwithstanding). However, all the other DPP areas were diluted to the point that the KMT should be able to win all seven of the remaining districts. So let’s see what the DPP could have done to better its lot. This should also illustrate how the KMT created its masterpiece. There are some minor changes that would have been well within the spirit of the process and could have been adopted. I’ll also put together my “evil genius” plan, a no-holds barred American-style plan full of unlikely combinations that would never have passed here. It’s shocking to see just how much the DPP left on the table. Zhongshan District is usually thought of as one of the DPP’s best areas in Taipei City. It combines with Datong to form a city council district, and the green camp routinely beats the KMT in votes and seats in this district. One obvious DPP demand was for that city council district to simply form a new legislative electoral district. After all, it is the right size. However, doing that leaves an awkwardly sized population in Shilin and Beitou to the north. It might be possible to make Zhongshan and Datong into one electoral district, but I haven’t figured out how to do that in any reasonable way. Instead, the KMT plan combined Zhongshan, Songshan, and Xinyi districts to form two electoral districts. Let’s stick with that, because a minor change that wouldn’t require changing any other districts could have important partisan impact. Currently, the Songshan is split along Nanjing E. Rd, with the areas north going to D3 (Zhongshan) and the areas south going to D7. That dividing line is very strategic. There are two things here. Zhongshan is close, and Xinyi is not. So the KMT put as much of Songshan as possible into D3 in order to dilute the DPP strength there. Note that Zhongshan and Xinyi have roughly equal populations, but roughly 5/8 of Songshan went into D3. More importantly, they chose the best KMT areas from Songshan to put into D3. This meant strengthening the DPP a bit it D7, but that hardly matters. Geographically, Songshan is like a box within a box. Right in the middle of the district, there is a box (roughly the Minsheng Community area) with very strong KMT areas. In the outer box, the partisan balance is more like Zhongshan, with only a slight lean to the KMT. A strategic DPP planner could have drawn a vertical line roughly along Guangfu N. Rd. (to the south, Guangfu is the border between Da-an and Xinyi) that would have put most of that inner box into D7. This would also have reversed the population ratios, with D3 now being about as small as the original D7. This shift would increase Su’s vote share from 44.0% to 46.2% in the new D3. This wouldn’t have created a “good” DPP district, but D3 would have become a significantly more possible district for the DPP. A 4.4% swing is nothing to sneeze at. He has all the electoral data put on maps down to the li level. I would should you myself, but I can’t figure out how to cut and paste stuff from there into this blog. The second change is very similar. Currently, Beitou, Shilin, and Datong combine to form two electoral districts. Overall, the two districts lean slightly to the DPP, but instead of two good DPP districts, there is a pro-KMT district. Lin’s plan would have created a better D5 for the KMT. Note that the part of Zhongzheng currently in D8 is actually the strongest KMT part of Zhongzheng. Lin really would have liked that to be in his district! Here’s what the new D5 would have looked like. D6 and D8 would have had an average of 221369 eligible voters, which would have been 13.4% below the mean. This is a change that would have helped the KMT. The equivalent change to help the DPP would have been to shift 20,000 more voters from D5 into D8, drawing the line in Zhongzheng a bit further north. However, since the district is already undersized, you couldn’t do too much more. Remember, the voters north of the line are already closer to the overall average than the ones to the south, moving half as many would not have that much impact. Now we start to get into some ideas that are pushing the envelope for what might be considered acceptable and what moves into naked partisanship. As we noted above, the DPP is fairly strong in Wanhua. However, this is not true in the neighborhood around Youth Park, which has a lot of public (read: military (read: mainlander)) housing. Conveniently, this borders the area of Zhongzheng that is already in D8. What if we cut out those areas and replaced them with some votes from Da-an? We’ll take the blocks between Xinsheng S. Rd. and Fuxing S. Rd. and between railroad and Xinyi Rd; this basically extends the district east two blocks. We won’t worry about how to replace those areas in D6. These are all minor shifts, but when you are so close to the 50% mark, these minor shifts matter a lot. Datong: north of Minquan W. Rd. Zhongshan: area south of Minsheng E Rd. and east of Songjiang Rd. D7 Da-an: south of Xinyi Rd. D4 gets all the non-competitive areas in the northern part of the city. This district includes most of Neihu, except for the very southern and eastern sections, and then it stretches west through Dazhi (the part of Zhongshan north of the river) and through the tunnel into Shilin, near the National Palace Museum and a bit north. I also really pushed the envelope by crossing the river on the eastern boundary of Songshan District in order to take in the Minsheng community area (but only that area and not the greener areas in Songshan to the north or south of it). D5 is my attempt to put together all the remaining areas in Taipei City that the DPP doesn’t get steamrolled in. This includes all of Nangang. In Neihu, it includes the of Neihu along the river (on the southern border) and on the eastern border, next to Xizhi. These areas are generally not very glamorous. The area along the river is some of the most industrial grit you can find in our fair city. In Songshan, the area right around the Ciyou Temple and Raohe Night Market is pretty good DPP territory. This is due south of the part I put into D4. Finally, the parts of Xinyi district on the northern and eastern borders are ok for the DPP. Roughly, you can think of this as areas near the Houshanpi MRT station. D6, D7, and D8 are hopeless for the DPP. I tried to put the best of the remaining areas into D6, but there isn’t much left. You have the northern and western parts of Songshan, the southeast corner of Zhongshan, most of Zhongzheng (the part of Zhongzheng that is in the actual D5), and the northern part of Da-an (just extend Zhongzheng eastward). D7 is the rest of Da-an and all the parts of Xinyi that we didn’t want in D5. D8 is the same as the actual D8, except we added the areas from Wanhua right around Youth Park. The population distribution is fine. The biggest district is 7% above the mean, and the smallest is 7% below it. I could have gone further here. Regardless, you will notice that the D1, D2, D3, and D5 are smaller than D4, D6, D7, and D8. What kind of monster have I created!?!? So here you would have one district with the DPP as a clear favorite (D3), two tossups or perhaps DPP slight advantages (D1, D2), and a fourth district that the DPP has an outside chance in if absolutely everything goes right (D5). The other fourth districts are impossible for the green camp. Of course, to get this you have to violate every sense of following the spirit of the redistricting guidelines. Oh, I could have been even more egregious, I suppose. I could have taken the one li in Nangang that borders Wenshan district and changed it from D5 to D8 even though there is only one little mountain road (that goes through a graveyard and a garbage incinerator) connecting them. But I didn’t leave too many opportunities like that left untouched. How do I feel about this? In some ways, I’m stunned that the DPP allowed themselves to get rolled like this. Even little changes, like my proposed changes #1, #2, and #4 would have created a significantly better electoral environment for them. #4 might be crossing the line of what is acceptable, but #1 and #2 certainly are not. It would not have been difficult to propose an alternate plan to the Speaker (Su Tseng-chang). At the very least, they would have had a 50-50 chance in a lottery of getting a better set of districts. Now, we could just assume that the DPP was stupid and naïve and got beaten on by the much more sophisticated KMT. I don’t like to make these kinds of assumptions. To me, any time you find yourself explaining something with the rationale that “people are stupid,” you probably need to rethink. That is usually an excuse for lazy thinking on your part. So I’m trying to find reasons that the DPP would have been against changes like the ones I outlined. With #4, there might have been sufficient commitment to ideas of playing fair, that spanning three districts and obviously cutting out a bad area just might not have been acceptable. Besides, any politicians wishing to run in D6 probably would not have been happy with such a switch. With #2, there were certainly DPP politicians (ie: most in Datong and Shilin) who would have been unhappy with the switch. #1 is the one that I think is the hardest to explain. The only thing I can speculate about is that someone in Songshan wants to run, and they would like to be in the Zhongshan District. However, I don’t know who this would be. My other reaction is that I’m relieved that they didn’t allow someone like me to draw the districts. It’s better for democracy if you don’t look at a district and immediately assume that it was drawn in this funny way for some political purpose. However, this is always a possibility in a system like Taiwan has now, with single-member districts. As long as you have to draw districts, the possibility of partisan manipulation is going to be present. To me, this is a very strong argument for electoral system change. I have other arguments as well. I generally think that this electoral system is a disaster on many fronts. However, even if this were the only problem, it would be sufficient to consider a different system. Enough of that silly policy talk. Let’s get back to elections! Before I go any further, let me take the unusual step of telling you my position on nuclear power: I’m ambivalent. I’m not necessarily for it, and I’m not necessarily against it. I could be convinced if only someone would answer a lot of questions. Like most people, this question was very far from my mind 10 days ago, but now we are all paying attention. These will be a critical few months in shaping opinions on nuclear power for the next generation. Mine might be among those shaped. Let me also say that this is going to be an explorative post. I’m exploring my own ideas. So things might not be too coherent. Anyway, I think the 4th nuclear power plant is probably the wrong battle. It’s going to open. The anti-nuclear crowd should probably try to attain a more reachable goal, such as shutting the older plants down ahead of schedule. Oops. I have slipped into advocacy, something that I’m not supposed to do on this blog. Sorry. We’ll blame it on the fact that I’m overly emotional from the Fukushima crisis. Tsai Ing-wen has announced that she will run for president, and everyone expects Su Tseng-chang to follow suit in the near future. This ends a couple of weeks during which many DPP leaders seemed to be trying to come to some consensus about who should be the nominee without going through a messy primary process. I am not surprised that Tsai effectively ended that pressure with her announcement. As the more junior of the two viable candidates, any negotiated solution would almost certainly have ended with her yielding to Su. More to the point, I am a little uncertain why so many people in the DPP seem to think that avoiding a primary is desirable. The DPP has always been an election driven party. That is, the most powerful people in the party are powerful because they were able to grab power through electoral victories. The natural way for them to decide who the nominee will be is through a test of strength. This idea that conflict should be avoided at all costs reminds me of the authoritarian era KMT who were constantly trying to consolidate power around the leadership 鞏固領導中心, because any struggle among leaders might tempt one of them to reach out for popular support – and that might lead to something terrible, such as democracy. The DPP should not get caught up in these sorts of debates. Democratic parties fight all the time about who will lead them and which direction they will go in. This is a healthy process. Moreover, the DPP has an important discussion that it needs to hold. In her campaign last year and in her announcement, Tsai spoke extensively about her vision of building a social welfare state. If she becomes the nominee and especially if she wins the election, she will take the DPP in a very different direction. They need to decide right now if they are willing to go in that direction. If they don’t want to shift in the direction of social welfare, then they should stay with Su, who will probably maintain traditional DPP economic policies. If most of the party wants to radically shift in the direction that Tsai wants to go in, they need to forge an internal consensus within the party. Otherwise, the DPP risks a crisis later down the road when they find that their leader is going in strange and unexpected directions. As a commentator, I’m not taking a position on whether building a comprehensive social welfare state is a good idea or not. I’m just saying that if the DPP wants to go in that direction, they need to forge a political consensus first. Politics must come first if the public policy is to have any chance of success. So I think it is a very good thing for the DPP that it will have an intensely fought primary. Taking the politics out of politics is usually a bad idea. I’m re-evaluating that judgment in light of Tsai’s announcement that she is stepping aside as chair to contest the presidential nomination. I did not assume that she would step aside since she didn’t bother to do so last year when she was running for New Taipei City Mayor. However, she presumably knew that she would step aside a month ago, and so she may have realized that the nomination power would accrue to someone else. If that is the case, then the decision perhaps was not aimed at strengthening herself within the party as a means of winning the presidential nomination. Or perhaps it was. She may have felt confident enough that she would leave her allies in charge of the party that this decision would work in her favor even if she weren’t personally chairing the meetings. At any rate, I think it is a lot more fruitful to think about all these decisions in terms of whose power was increased or decreased than in terms of statements to the press. Three years ago, DPP candidates got obliterated in most districts. Perhaps one lesson that DPP politicians learned is that it doesn’t do much good to win a nomination in a lousy district. Of course, they already knew this, but it seems to really have sunk in this time. We see all the DPP candidates desperately trying to seize a nomination in a good district, and no one seems remotely interested in the swing districts, much less the difficult ones. Nowhere is this more evident than in Taipei City. Taipei City has one district that the DPP should win (Datong-Shilin), one district that it has a weak but real chance of winning (Beitou-Tianmu), three districts that it has an outside chance of winning if everything goes right (Zhongshan-Songshan, Nangang-Neihu, Wanhua-Zhongzheng), and three districts that it has absolutely no chance in hell of winning (Da-an, Wenshan-Zhongzheng, Xinyi-Songshan). Right now everyone is piling into the one good district. Currently there are four strong candidates (Tuan Yi-kang 段宜康, Yao Wen-chih 姚文智, Kuo Cheng-liang 郭正亮, and Luo Wen-chia 羅文嘉) and another (Chuang Rui-hsiung 莊瑞雄) has announced but withdrawn. I haven’t heard of anyone expressing interest in any of the other seven districts. It doesn’t take much imagination to see how this is going to unfold. One of these four will win the nomination, and the other three will start looking for a new district. Perhaps they will suddenly discover a burning passion to serve the voters of Beitou or Zhongshan. Of course, this has all been facilitated by the DPP’s decision to designate 40 districts as “difficult.” By leaving these 40 districts empty and available for losers, the DPP is basically inviting all strong candidates to take a shot at winning one of the “good” nominations. There are always lots of consolation prizes. Moreover, many of these so-called difficult districts are ones that the DPP should plan on trying to win. Given the swing in popular opinion that we have consistently witnessed over the last year and a half, several of these should be considered tossup districts and many others are in the realm of possibility. So the dilemma that the DPP faced was this. On the one hand, it has the current system in which many politicians will end up as nominees in a district they did not really want to be in. There is the risk that the KMT opponent will hammer them with this. “My opponent really wants to be in Xinzhuang City. I have always wanted to represent the people of Danshui and no one else. He’s only here in Danshui because they didn’t want him in Xinzhuang. Well, we don’t want their rejects!” It might be far better if the DPP required everyone to choose a district from the beginning so that some of the stronger politicians might strategically decide that they have no chance of winning the nomination in the good district and just go straight to the weaker district. This is what the DPP has always done in the past. For example in 2001, they required members to choose whether they wanted to contest the county magistrate, district legislator, or list legislator nominees. They didn’t hold county magistrate nominations first and then let the losers run for legislator. On the other hand, the DPP might calculate that, regardless of their nomination system, the strongest politicians are overwhelmingly going to try for one of the good districts. If they were to force everyone to choose at the very beginning, the result would be that a lot of strong candidates were effectively ruled ineligible and you would have a field of really weak candidates running in tossup districts. Interestingly, they did not decide to have a second round of primaries in the difficult districts. That is, they could have settled the nominations for the 33 strong districts in April and then started the whole process over for the other 40 districts with primaries being held in June or July. If no one wanted to contest them, they would still have the option of drafting someone. Instead, they decided to have all those nominations decided by the central party headquarters. I don’t know why they went this route. Maybe they worried that candidates who had already lost one primary would be financially or organizationally too exhausted to contest a second primary. Maybe those candidates simply wouldn’t have any credibility in a new district so soon after losing in a different district. Or maybe the people in control of the party headquarters wanted a bit more power in their hands. I’ve been working a lot on the redistricting process from 2005-7, and one of the most striking things about the process was just how non-partisan it was. This is not to say that it was completely non-partisan. In fact, you find numerous indications of struggles for partisan advantage. What I’m trying to say is that I expected a lot more. Instead, almost every district (and indeed almost every proposal that was not eventually adopted) looks like it could have been drawn up by some person with detailed knowledge of local history, geography, economics, and transportation networks but absolutely no idea of the partisan balance. In short, the designers showed remarkable restraint, possibly because they were electoral commissions and had to explain all their decisions without reference to partisan strength. One of the mental exercises I’ve been doing is to throw all that restraint out the window and try to design a more advantageous plan for one party or another. Sometimes this is really easy (eg: producing a better plan for the DPP in Taipei City), and sometimes it is extremely hard. Here, I want to look at one of the hard cases. Taipei County had 12 seats, the most in the country. You would thus expect that there are lots of different variants, some better for the KMT and some better for the DPP, to choose from. My theory says that, due to local conditions, the plan chosen should have benefitted the KMT. This means that I should be able to see, or at least imagine, an alternate plan that is better for the DPP. So let’s try to produce that plan. First, there are some rules. You have to respect geography, transportation networks, historical influences, and so on. (This is as vague as it sounds.) The population of any district can’t exceed 15% from the county mean. Taipei County had 3698674 people, which means that each district should have an average of 308223 people. So each district has to be between 85% (261990) and 115% (354456) of that mean. You also have to respect township boundaries. Unless a township exceeds 354456, it should not be divided between two electoral districts. This restriction is not absolute, but you should try very hard not to violate it. Four townships (Banqiao 板橋, Xinzhuang 新莊, Sanchong 三重, and Zhonghe 中和) have to be split. It goes without saying (because it was so self-evident that they didn’t actually say it in the law) that districts must be geographically contiguous. There is also one more rule that no one ever mentioned that I think was implicit: no township should be split into more than two pieces. So here is the final plan. It turns out that it is extremely hard to come up with a fundamentally different plan. Yes, you can jigger a few lines here and there and switch a few voters, but it is very hard to design anything that looks completely different from this plan. To understand why this is, start in Yonghe 永和 (in the 7 o’clock position). Yonghe has a population of 234381, so it needs a few more people to get to the minimum population. Since Yonghe only borders one township, Zhonghe, it is pretty obvious where these people will come from. Conveniently, Zhonghe is too big to be its own district and needs to be split. 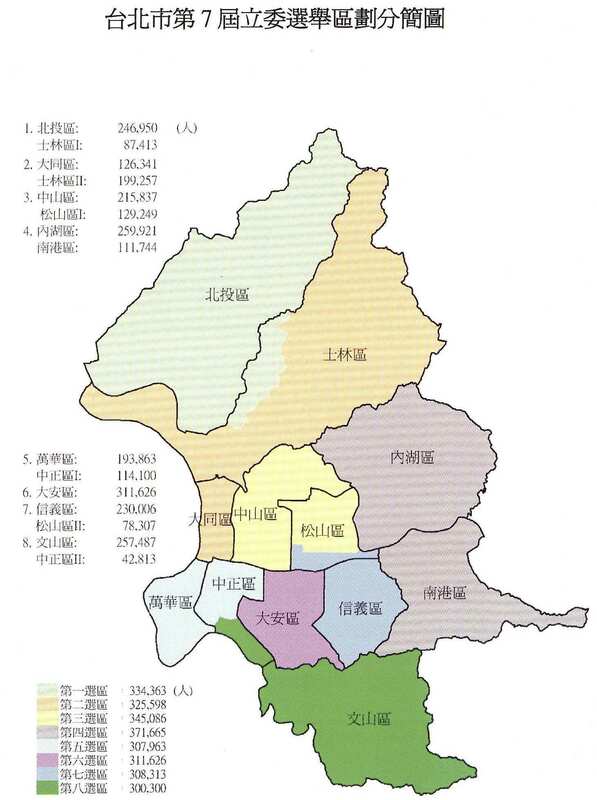 So the plan combines 69523 people in Zhonghe with all the Yonghe residents to form District 9 (D9), and all the other 337592 people in Zhonghe form D8. Now, you could take a different 70000 people from Zhonghe, but both districts are so heavily pro-KMT that it wouldn’t matter. (In fact, they appended the bluest areas of Zhonghe to Yonghe, which is even bluer. So this plan is relatively good for the DPP, except that the DPP has very little chance of winning even this Zhonghe district.) So, given our rules, you basically can’t avoid these two districts. However, it turns out that this start goes a long way to determining the rest of the districts because Zhonghe links the townships to the east and west. Now, on the map, Xindian 新店 (to the east) borders both Tucheng 土城 and Sanxia 三峽 (to the west), but those borders are all mountainous. On the ground, everything goes through Zhonghe. In other words, you can’t combine Xindian with Tucheng or Sanxia. So let’s move east, going counterclockwise around Taipei City. There are three huge puzzle pieces: Xindian (284997), Xizhi 汐止 (172909), and Danshui 淡水 (127140). Everything else to the north, east, and south of Taipei City is relatively small. None of the big three townships can go into the same electoral district, and none of them are big enough to split into two districts. So you have to have one electoral district centered around each of the three townships. So this means that you split the small townships in the SE region somewhere between Xindian and Xizhi to form D11 and D12. Politically, it really doesn’t matter where you do this, since Xindian and Xizhi are so heavily blue that they simply overwhelm the green tendencies in the smaller townships. The only flexibility is on the eastern border of the Danshui district (D1). (Note: Danshui is the township on the north coast on the east bank of the mouth of the river.) There are four townships between Danshui and Xizhi. You can include as many of these as you like in D1. So, to the east side of the river, D1 can have between 127140 and 203725 people. Either way, we have to add some more. Let’s go ahead and add 31527 from Bali, across the river. Now we have between 158667 and 235252. Still not enough. Let’s stop for an aside from a Xinzhuang-centric 新莊 viewpoint. I do this both because a politician based in that area screamed bloody-murder about the unfairness of the plan, and also because I think that this is probably how most people look at redistricting. If you don’t think about the rest of the county, then it is quite obvious how things should be divided from the Xinzhuang perspective. Xinzhuang is a big city on the north bank of the Da-han River 大漢溪, and it serves as the major economic center for the townships to the north. If you combine the populations of Xinzhuang, Wugu 五股, Taishan 泰山, and Linkou 林口, you get 586888, which is enough for two districts. If you add Bali 八里 (though Bali residents might argue that they have closer ties to Danshui), you get 618415, which is almost perfect. So obviously, there should be one district with Wugu, Taishan, Linkou, Bali, and part of Xinzhuang, and another district made up from the rest of Xinzhuang. Wonderful! This even leaves a viable pair of districts for Sanchong 三重 and Luzhou 蘆洲, which together have 566882 people. Unfortunately, as we have already discovered, this won’t work because of the areas on the north and east of Taipei City. You would have to split Xizhi, and Xizhi isn’t big enough to be split. So for mechanical reasons, what seems perfectly reasonable from the Xinzhuang-centric point of view turns out not to be viable. Let’s go back to D1. D1 has Danshui, Bali, and zero to four of the smaller townships on the north coast. To meet the population requirement, we must add one or two of Wugu, Linkou, and Taishan. Hold that thought. We started in Zhonghe and moved counterclockwise. Let’s go back and move in the other direction. Banqiao 板橋 is to the northwest of Zhonghe. Banqiao has 539534 people. You can legally split this into two districts and be within the 15% limit, but they are pretty small. We’d like to add some people if possible. Unfortunately, it’s not clear where these people should come from. To the north of Banqiao is the Da-han River. This is a big geographic barrier, and it seems to violate common sense to add areas from the other side. To the west and south are Shulin 樹林 and Tucheng. Neither is big enough to split. To the southeast is Zhonghe, which could spare 30000-40000 people. However, Zhonghe has already been split, and this would require splitting it into three pieces. Imagine the outrage. All of these options have obvious flaws, and the obvious thing to do would simply be to split Banqiao into two very small districts. That is what eventually happened to form D6 and D7. Wait, there’s something else. There is a partisan dimension to having small Banqiao districts. The areas that might be added could affect the balance of power in the new D6 and D7. The DPP is a lot stronger in Xinzhuang and Sanchong across the river, but adding people from those areas is highly unlikely. 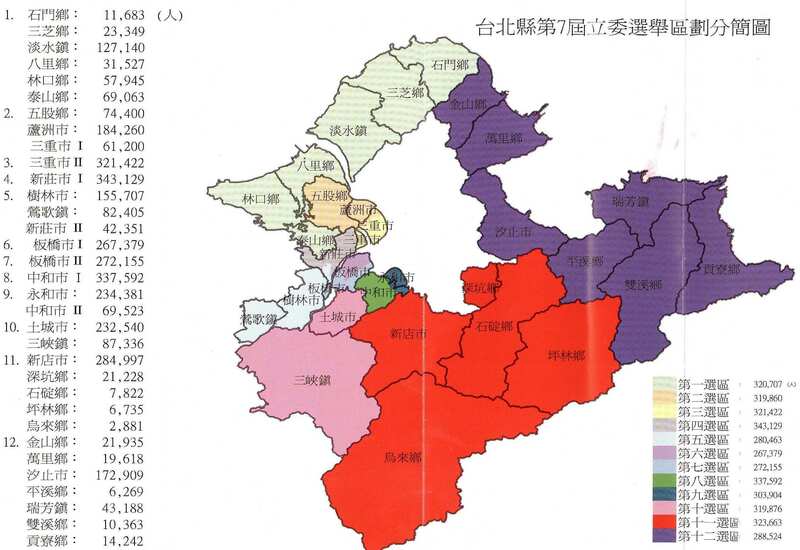 More interestingly, the areas of Tucheng and Zhonghe that abut Banqiao are the DPP’s strongest areas in those cities. The Zhonghe areas are slightly more pro-KMT than Banqiao and the Tucheng areas have a slightly more DPP tilt. This matters because Banqiao is currently almost a tossup. Moving the balance just a bit one way or the other could be decisive. Now, the Tucheng areas come out of another tossup district, so the only question there is whether you would rather win one district or another. However, putting the Zhonghe areas with Banqiao would strengthen the KMT in both Banqiao and D8 (which would be losing the only areas in which the two parties are even close and thus become even more overwhelmingly blue). However, it’s a small shift, and it would require splitting Zhonghe into three pieces. So if you aren’t going to do any of that, and you just keep the two small Banqiao districts, the next step is obvious. Tucheng and Sanxia almost have to form D10, since there is nothing left unused to their southeast. Fortunately, they jointly have 319876 people, which is almost ideal. However, the next townships over, Yingge 鶯歌 and Shulin, don’t have quite enough people (238112) to form their own district (D5). This means D5 needs a few more people, and Xinzhuang is the only available source. The rest of Xinzhuang then forms D4. This brings us back to D1, D2, and D3. Sanchong is too big and has to be split. So most of Sanchong will form D3, and the rest can only go across the river to Banqiao (which we have already dismissed as unrealistic), west to Xinzhuang (which already has enough people), or north to Luzhou. Conveniently, Luzhou and Sanchong have close ties historically, economically, transportationally, politically, etc-ly. Sanchong and Luzhou have enough population to form two undersized districts, but D1 can only include two of Wugu, Taishan, and Linkou. Since Wugu adjoins Luzhou, it has to go into D2 while the other two go into D1. Shockingly, there is very little room for maneuver in all this. Nearly every significant change entails breaking one of our explicit or implicit rules. You can fiddle around with some of the minor details, but it is very hard to come up with something fundamentally different. What kind of partisan impact would this have? D6 and/or D7 would probably be slightly more prone to go to the DPP than in the actual plan. D10 would probably be about the same. It would lose some mildly pro-DPP areas to D6 and D7, but it would gain Yingge, which is also mildly pro-DPP. D5 would effectively be trading Yingge for Taishan and a little more of the western tip of Xinzhuang. This is probably a slight gain for the KMT. D1 would lose Taishan but gain Jinshan and Wanli. That’s probably a wash. D11 and D12 are too blue to worry about any minor changes. Overall, the partisan impact would be mild, though it looks to me like it would probably benefit the DPP more than the KMT. The bigger impact would be on which politicians from each party were advantaged. For example, in the current D10, Tucheng makes up about three-fourths of the district. That makes it all but inevitable that the representative will come from Tucheng. In the alternate plan, Tucheng is only about half of the district, and a good chunk of Tucheng is buried inside one of the Banqiao districts. This makes it a lot harder for an ambitious Tucheng politician to win a legislative seat. The other alternate plan is much simpler. Currently Banqiao City is divided into a northern and southern district. Earlier, I said that they were both tossup districts, but that isn’t quite right. After the Tsai Ing-wen’s strong performance in the 2010 election, they look like tossup districts, but from a longer term perspective, the KMT should be slightly favored in both. Even more precisely, the KMT has a very miniscule edge in the northern district (D6) and a somewhat larger edge in D7 (where the KMT is roughly 3% stronger). Tsai Ing-wen got 50.3% in Banqiao, so I’m guessing she won about 49% in D7 and 52% in D6. Now, since Banqiao has to be divided, it can be divided in pretty much any way you like. If I wanted to put as many DPP votes as possible into one district and as many KMT votes as possible into the other, I would slightly tilt that axis and have a northeast and a southwest district. By doing that, you could shift about each district by about 2%. That is, instead of being 3% different, the two districts would be more like 7% different. Instead of having two districts that are roughly similar, one would be clearly better for each party. To put it another way, looking from the lens of 2006, in the actual plan the KMT seems to have a slight advantage in both districts. If we redivided Banqiao, the KMT would be favored to win one district easily, but the DPP would have a good chance of winning the other district. If I were a local KMT politician in 2006, I would want two good districts to choose from. Likewise, if I were a local DPP politician, I would want one solid district rather than two possible but not likely districts. However, if I were a national party strategist, I might want the opposite. If the DPP wants to win a majority in the legislature, it probably has to win both of these districts. By making them both roughly the same, the planners marginally increased the DPP’s chances of taking power in the legislature. With 12 districts, this doesn’t seem like a whole lot of scheming. Of the three viable plans that I can think of, the eventual one was perhaps the most advantageous for the KMT. However, these advantages are surprisingly slight. Given the original rules, there really isn’t much to complain about for either side. As expected, the DPP won both seats rather easily. This wasn’t a surprise. The KMT couldn’t win either one of them in 2008 in the midst of a huge KMT wave and with incumbents in both races. Popular opinion has since shifted dramatically away from the KMT, they had clearly inferior candidates running this time, and by-elections (at least in these couple of years) seem to play overwhelmingly to the DPP’s strengths. But I still have a few thoughts rolling around my head. The KMT didn’t even seem to try. Their best candidates didn’t run. We all know about how their top two choices declined to run in Tainan. In Kaohsiung, they couldn’t even find a serious KMT member to run. Instead they went for a former DPP member’s son who brought very little to the table. The top party leaders also didn’t seem interested in sticking their necks out. One of the big papers had photos of the last night’s events on its front page. All five of the DPP’s top leaders were out on the hustings. The KMT was represented by Vice President Siew 蕭萬長 and Vice Speaker Tseng 曾永權. Ma 馬英九 and Wu 吳敦義 made a few perfunctory appearances, but for the most part it appeared as if they did not want to be associated with the impending debacle. After the election, the KMT seemed shocked that the turnout had been so low. More and more, I am convinced that turnout is a function of excitement, not grassroots organization. The KMT seems to think the opposite is true. The KMT is replacing its local party chairs for failing to mobilize voters. I think the fault lies with the top leadership who effectively told their supporters not to bother since there was no chance of winning. Given the KMT’s miserable performance, I wonder if the biggest loser isn’t actually Hsu Tain-tsair 許添財. Hsu won the Tainan seat with 61% of the vote. I wonder if that isn’t, in fact, underwhelming. (Yes, the other half of me thinks it is a bit ridiculous to call a 60% victory a sign of weakness.) A DPP city council member associated with Mayor Lai 賴清德 has already announce that he will challenge Hsu in the primary. Actually, he announced this before the voting was held. Hsu really could have used a crushing victory to convince his rivals that any fight was hopeless. He didn’t get it. In fact, compared to Lin Tai-hua’s 林岱華 70% landslide, Hsu’s victory makes him look surprisingly vulnerable. My nominee for the biggest winner of this whole thing might also be something of a surprise: KMT legislator Chiang Ling-chun 江玲君. Chiang represents the Fengshan City district. In 2008, she barely beat Lin Tai-hua. She hasn’t been the most visible member of the legislature over the past three years, and I wouldn’t be too optimistic about her chances in a rematch with Lin. However, Lin is now out of the picture, safely ensconced in another district. Chiang will face a stiff challenge from someone, but her opponent will probably be significantly less intimidating than Lin would have been. You are currently browsing the Frozen Garlic blog archives for March, 2011.